The Central Library of the New York Public Library (NYPL) on 5th Ave. appears on many postcards as I have written in a previous blog post. I recently acquired two postcards depicting interior views of the library. They were of particular interest to me because they both show people using the library, a postcard subject of special appeal. The address sides of the postcards also contain interesting information, another postcard aspect of special appeal. 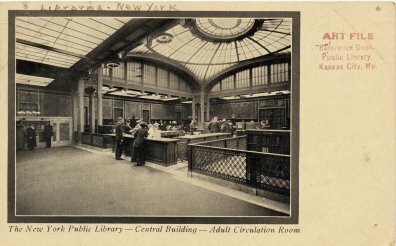 The first postcard shows the adult circulation room of the Central Library. It was mailed to the Circulation Dept. of the Kansas City (MO) Public Library (KCPL) by "three travelers" who were probably staff members of the KCPL. Perhaps they were visiting other libraries or were attending a library meeting. The postcard was at one time in the Art File of the Reference Dept. of the KCPL. 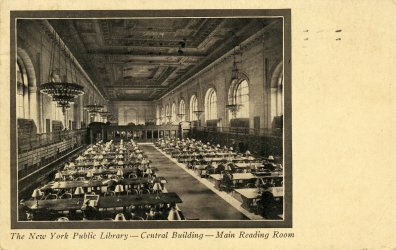 The second postcard shows the famous main reading room of the NYPL's Central Library. 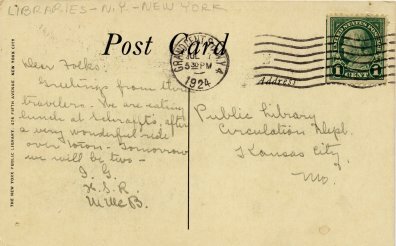 The postcard was mailed to Hiawatha, KS and the message reads: "This is some library and reading room. Thought you might want one to add to your collection." Perhaps the recipient was a collector of library postcards, like me. 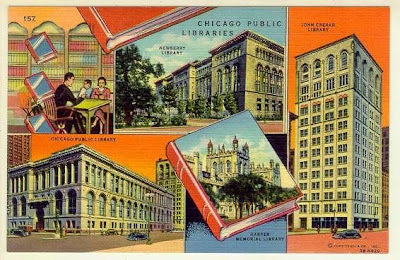 My favorite "linen era" library postcard (shown above) was produced by the Curt Teich Company and depicts four Chicago libraries. The Curt Teich Company of Chicago was founded in 1898 and ceased producing postcards in 1978. This postcard was first published in 1937 and was mailed in 1942. 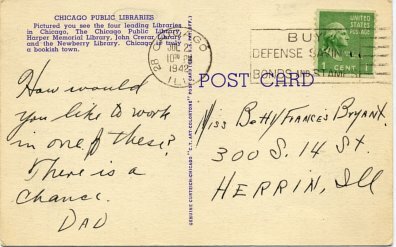 The four libraries on the postcard are the Chicago Public Library, the Newberry Library, the John Crerar Library, and the Harper Memorial Library of the University of Chicago. The postcard is addressed to Miss Betty Frances Bryant and the message on the card reads: "How would you like to work in one of these? There is a chance. Dad". The Chicago Public Library building on the postcard is now the home of the Chicago Cultural Center. The Newberry Library continues to occupy the same building that is depicted on the postcard. That is also true for the Harper Memorial Library. The John Crerar Library is now affiliated with the University of Chicago and occupies a building on the university campus. 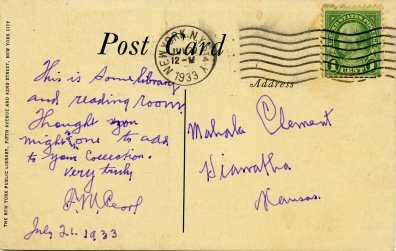 The John Crerar Library occupied the multistory building on the postcard, located on Randolph Street, from 1921 until 1962. The building was demolished in 1981. The American Library Association was located for a period in both the Chicago Public Library building and the John Crerar Library building (see my digital history of ALA). The Chicago Cultural Center, the Newberry Library, and the Harper Memorial Library are all worth a visit if you have time while attending the American Library Association conference in Chicago in June. I'm a big fan of presidential libraries and museums so I'm excited that the George W. Bush Presidential Library and Museum is being dedicated on Thursday. It will open to the public on May 1st. This will make the 13th library and museum that falls under the purview of the Office of Presidential Libraries of the National Archives and Records Administration (NARA). I've been able to visit eight of these and I'm looking forward to visiting the rest. Although these libraries have been described by some as presidential temples or pyramids, I think they provide valuable looks at important segments of our history. The Franklin D. Roosevelt Library and Museum, dedicated in 1939, was the first of the NARA presidential libraries. The Herbert Hoover Library and Museum was created retroactively. Up until 1978 the archives and artifacts of a president were actually considered to be the personal property of the president. So the papers of early presidents were often dispersed widely and inconsistently. Fortunately the Library of Congress has managed to acquire extensive archival materials for the first 23 presidents. 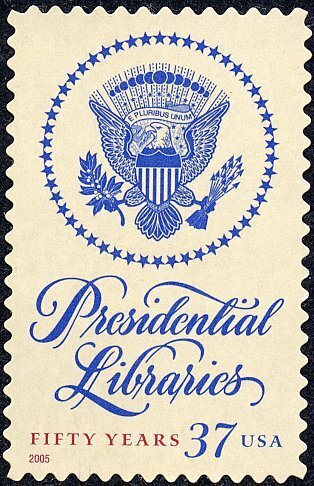 The presidential libraries and museums are well represented in my collection of librariana and I even have a philatelic exhibit about them. Many postal artifacts were created as a result of the 2005 presidential libraries postage stamp which added significantly to my collection. 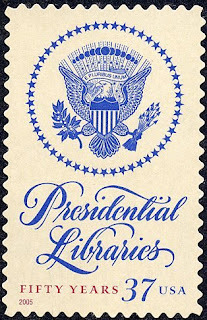 Click HERE to see a previous blog post about presidential libraries. 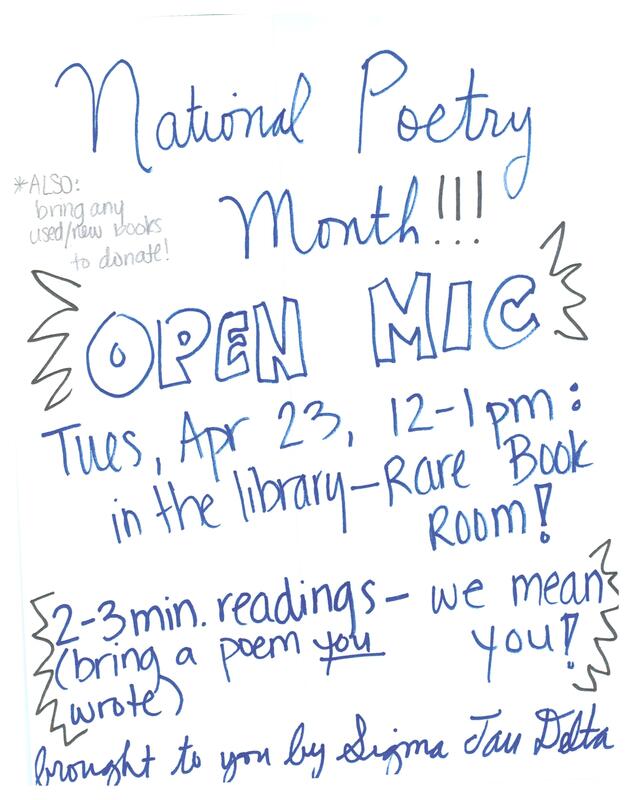 In honor of National Poetry Month, the Gleeson Library is pleased to co-sponsor with Sigma Tau Delta an “Open Mic” poetry reading in the Donohue Rare Book Room on Tuesday, April 23rd from noon to 1:00 p.m. Students are encouraged to perform 2-3 minute readings of their original work. Do not miss this opportunity to celebrate poetry and honor student voices. The program is free and open to the public. Light refreshments will be served. All are welcome to attend. For further information, please call (415) 422-2036. Each year since 2003 I have participated in the competitive exhibiting component of several national level stamp shows. All of my philatelic exhibits are related to the history of libraries in the United States. The content of the exhibits varies from year to year. In 2012 I had a very successful exhibit titled "America's Public Libraries and Their Forerunners 1731-1956". This year I significantly revised that exhibit and it is now titled "Libraries in 19th Century America". The new exhibit includes only 19th century material and includes artifacts for all types of libraries, not just public libraries and their predecessors. The first showing of the revised exhibit took place at the stamp show in Plymouth, MI (just west of Detroit) this past weekend. I was pleased to receive a gold medal for the exhibit and a special creativity award. I will also be showing the exhibit at stamp shows in Denver, Minneapolis, and Milwaukee this year. For a summary of the evolution of this exhibit, click HERE. 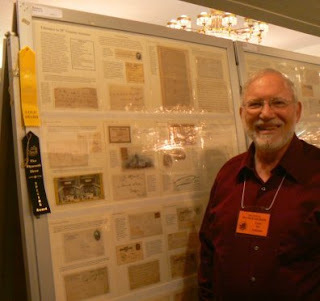 For information on some of my other library history related philatelic exhibits, click HERE.